"Ruby's Favorite Things," is a program partnering with online retail shops where a percentage of sales supports Dharamsala Animal Rescue mission. My homeless friends need your help. 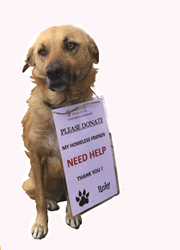 Ruby, the Dharamsala Animal Rescue (DAR) Mascot, is always tirelessly fundraising to help her homeless friends in Dharamsala. Ruby was rescued by Dharamsala Animal Rescue at six months old. She was suffering from distemper but with DAR's care, she survived. Now, she wants to help others like her. Learning from the best, Ruby opted to create her own version of "Oprah's Favorite Things" in the spirit of giving. Launching in time for this Mother's Day, May 8th, Ruby has partnered with Rescue Chocolate, Amazon Smile, and Dog Collar Boutique. Each of our partners will donate a percentage of purchases to DAR and help Ruby's friends. Two other partners coming on board soon are Smiling Dog Coffee and Bark Shop! Keep Ruby's page bookmarked as she hopes to keep growing this list to make shopping fun and meaningful. The page also contains directions on how to make sure purchases will result in a donation to DAR. Dharamsala Animal Rescue was founded in 2008 and is a registered 501c3. Dharamsala Animal Rescue has been working to improve the lives of dogs living on the streets of Dharamsala while inspiring more compassionate behavior towards stray dogs in the community. Help Decrease Suffering and Increase Compassion!